Enjoy a 3 night stay for 2 guests in a Mod Pod Room at 19 Rooms, an urban boutique hotel in the beautiful and historic city of Valletta in Malta. Stay is valued at approximately €390 EUR / £345 GBP / $445 USD*. Please note all additional purchases including meals, drinks, excursions etc. must be paid for by the winner separately. Please also note the winner and their guest will be required to pay the Environmental Fee of €0.50 per person, per night directly to the hotel. Auction stay dates: to be booked in advance and taken before between: 03 November to 21 December 2019, 04 January to 15 March 2020, or 03 November to 21 December 2020, subject to availability. 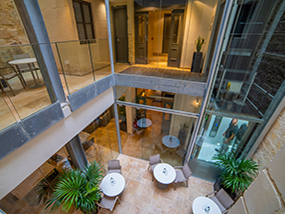 19 Rooms is a striking urban hotel found in beautiful Valletta, the tiny capital of the Mediterranean Island of Malta. This historic walled city was established in the 1500’s on a peninsula by the knights of St. John. The city is known for its museums, palaces, grand churches, and baroque landmarks like St. Johns Cathedral with its opulent interior and home to the Caravaggio masterpiece ‘the beheading of Saint John’. Previously a 300 year old palazzo, 19 Rooms is now a contemporary and chic urban hideaway in Valletta. The building has been lovingly and attentively renovated from scratch by a young and adventurous team who turned this already special building into a beautiful, no expense spared, but very down to earth boutique hotel. 19 Rooms offers guests a gorgeous internal courtyard come lounge and chill out area, where guests can put their feet up and disappear into comfortable armchairs that lie on the funky tiles floor or simply take a book off the shelves and spend the afternoon relaxing with coffee and good music in front of a lovely fireplace. The hotel also features complimentary wifi, a public carpark outside the city, free coffee and croissants, lift, beach towels, tour, activity and dining reservation service and daily housekeeping. In terms of dining, Trabuxu Bistro and Trabuxu Wine Bar, run by the same owners as 19 Rooms, offer an excellent selection of food and drinks with great service. The Bistro offers a selective and seasonal menu of fresh fish, meat and pasta while the Wine Bar lies hidden below street level in a 400 year old stone vaulted cellar, and has been serving patrons for over 15 years, making it Valletta’s premier wine bar. Trabuxu Bistro and Trabuxu Wine Bar lie about 700m away from the hotel at the other end of the city but are well worth a visit! Rooms at the hotel are as comfortable as they are practical. Original stone features adorn the walls, making them even more unique. The winner and their guest will be staying in a cosy and stylish Mod Pod with comfy queen size bed, private shower, bathroom amenities, hairdryer, air conditioning and heating, safe, free wifi, satellite TV and speakers, and a munchies tray. Please note children under the age of twelve are not permitted to stay at 19 Rooms. Luxury Travel Diary terms and conditions apply. *This auction item is valued at approximately €390 EUR by 19 Rooms, Valletta, Malta – please note this valuation is the list price provided to Luxury Travel Diary by the Auction Prize Provider and should be used as a guide only as cheaper discounted rates may be available. No cash alternative is available. This auction item excludes flights and transport – you will need to arrange your own flights / transportation to and from your home to 19 Rooms, Valletta, Malta to coincide with your booking. Your stay is subject to availability, must be booked in advance and taken between: 03 November to 21 December 2019, 04 January to 15 March 2020, or 03 November to 21 December 2020. Please also note the winner and their guest will be required to pay the Environmental Fee of €0.50 per person, per night directly to the hotel. Please note any associated taxes / resort fees / entrance fees etc. and additional purchases will be collected from the winner by the relevant property at the time of booking your stay or on departure and will not be deducted from the amount bid for the item. Winners must pay for their auction item in full via PayPal within 48 hours of the auction end. The full Terms of our auctions can be found here. To the fullest extent permitted by law, Luxury Travel Diary will not be liable for any loss or damage arising out of the winners’ use or enjoyment of the prize; and the winner acknowledges that Luxury Travel Diary accepts no responsibility whether directly or indirectly for any claims whatsoever arising in respect of the prizes provided by third party providers or sponsors.